The first time I had Hungarian Paprika Chicken my daughter was in the 3rd grade. I went to a school event where families shared a recipe from their ethnic heritage. A good friend of my daughter's parents are from Hungary and they made this dish. Well, their version was creamy. I have a kid who is severally lactose intolerant, so we added sour cream individually. It works well, of course you can just add it into the entire dish when the dish is done cooking. 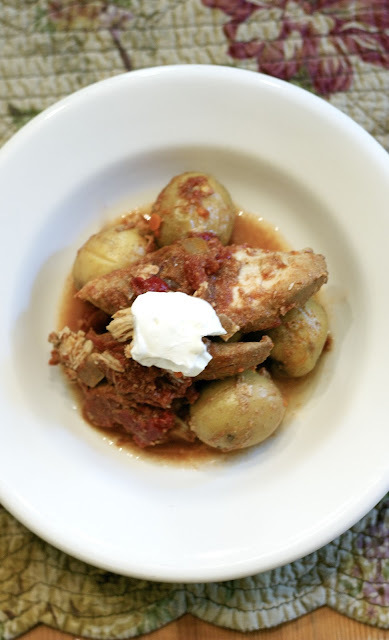 Hungarian Paprika Chicken is a very simple dish that has wide taste appeal. It is basically just chicken, onions, tomatoes, peppers and Hungarian Paprika. You can add potatoes or not. It is delicious served over egg noodles too. I used fire roasted peppers to kick the flavor up a bit, but you can use plain roasted or even fresh red peppers. 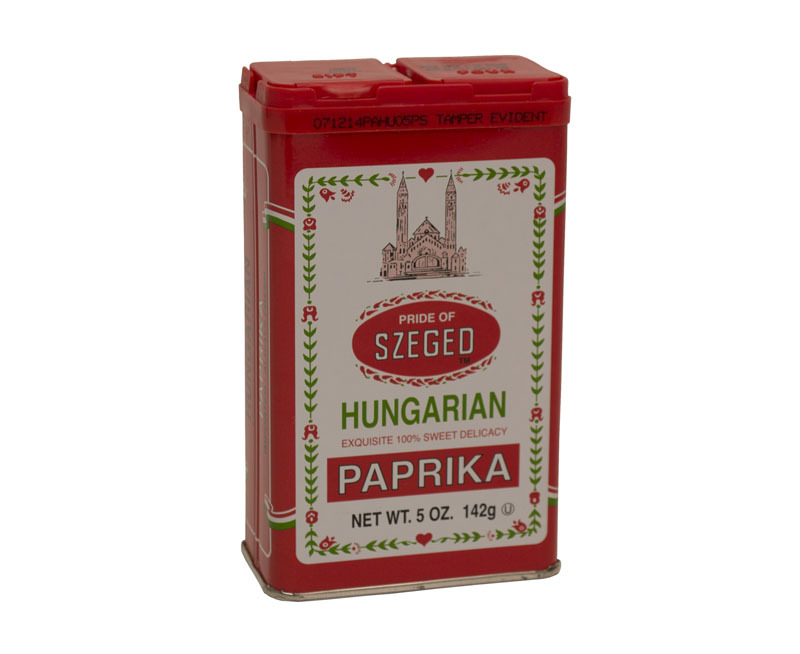 I think it is important to invest in Hungarian Paprika since it is the main seasoning in the recipe. It taste different from regular paprika and it is a nice change in flavor for other dishes you might make that call for paprika. When looking for Hungarian Paprika in the grocery store it is usually sold in tins. A common variety will look like this picture below. 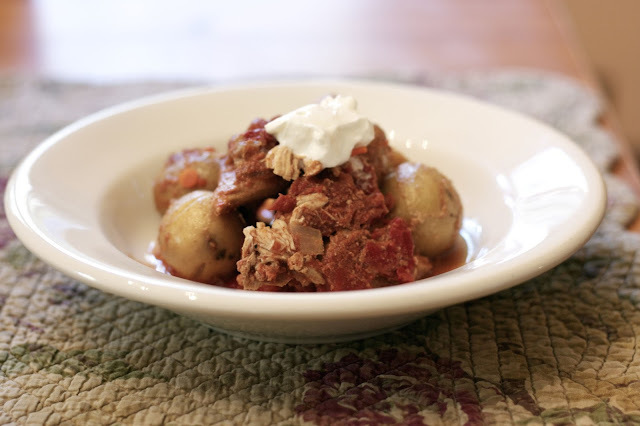 Please check out the other Food of the World participates Hungarian recipes and join us each month by signing up for the mailing list. 1) Microwave potatoes on high for 5 minutes then put them in the bottom of the slow cooker. 2) Mix together: chicken broth, butter, paprika, salt, pepper, diced tomatoes and peppers. 3) Put the chicken on top of the potatoes and pour the chicken broth mixture over the pieces getting some sauce on all of chicken. 4) Cook on low for 6 hours. 5) Garnish with sour cream and fresh parsley. We will be visiting Canada on Nov 10th. Please check out the dishes others made from Hungary on the linky below. If you have a dish you like to share please add it to the party. Join our mailing list and cook along with us. This looks amazing, Diane. I have also found that the paprika you use makes a difference in flavor. I made a fish dish, but don't see the linky(?). For now just put your link in the comments. Sounds simple and delicious! And Bill friendly, too!!! Thanks Liz good to hear from you. That is such a spicy and creamy looking dish. This looks like a very comforting dish with lots of flavor. Thanks so much for sharing with Full Plate Thursday and have a great weekend! 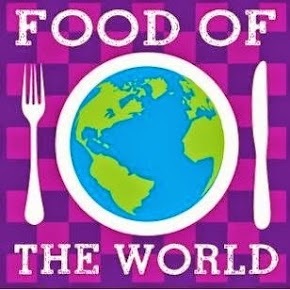 What a great event for a school to hold - it's so much fun learning about other people's culinary heritages. Thank you for sharing this tasty Slow Cooker Hungarian Paprika Chicken with us at Hearth and Soul, Diane. I like how you have made it possible to add the sour cream after cooking too! I agree it was great to learn about other cultures and it was fun too.